My new thought process is to think like a size 8. I am currently about a 12 and my goal is a comfortable size 8. I have been every thing from a 0 – 14 over the past 20 years. That sounds crazy right? It felt crazy to just write it down. Out of all the sizes I think 8 is were I would like to be right now. My body has change and weight has shifted to different places. I feel as though an 8 would look perfect on me. In pounds that may be about 25 pounds away. So I am thinking like a size 8. I have already been going through my closest to pack away many of my larger clothes. Why? Because I am a size 8, I don’t need those. I have also been going through the smaller clothes I have packed away so I can start wearing them. I am not delusional I know that I can not wear them yet….YET. However, I will soon. I know that. I am confident of that. I am excited. A couple things that I have started recently are wearing ankle weights during the day and drinking water. Those are obvious things to most but obviously I have not been doing them. I found this great 64 oz chugger at 5 below and I love it. That is also where I got the ankle weights. 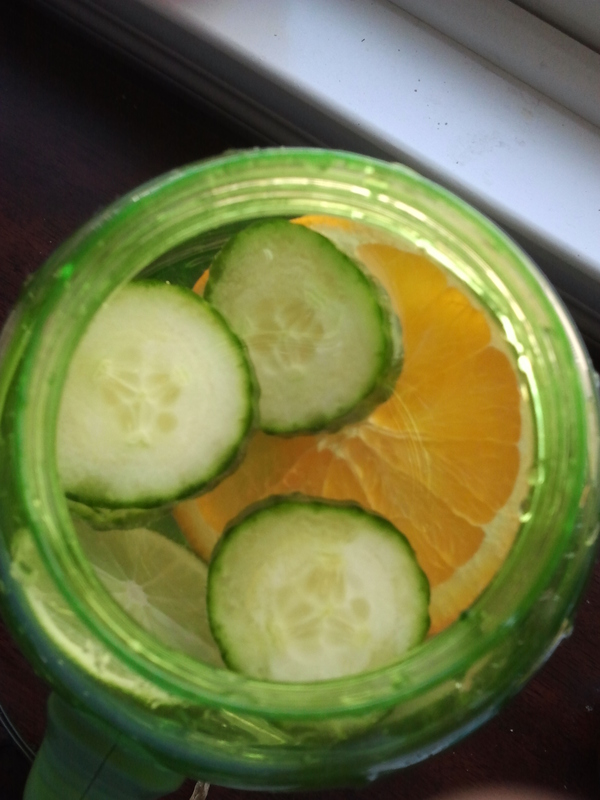 I fill my chugger with water and add sliced cucumber, lemon, lime and orange. 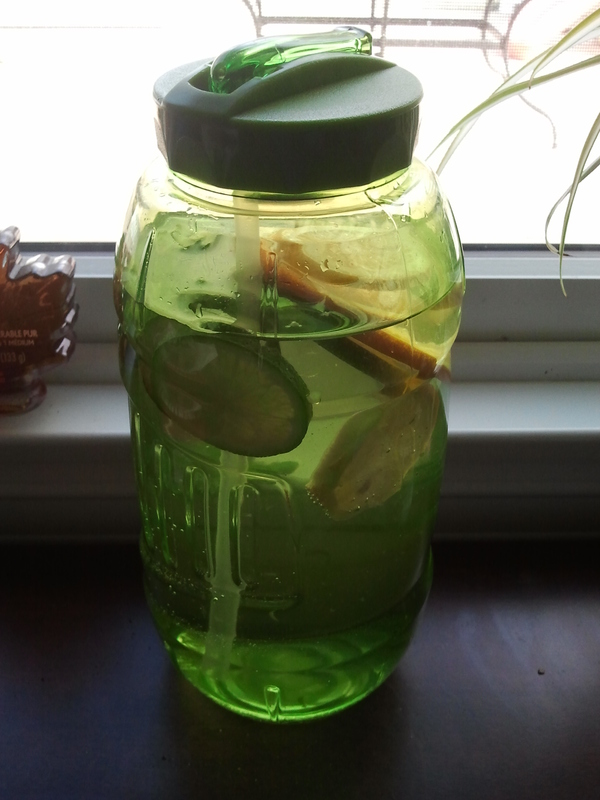 I also add a peppermint tea bag for a few minutes to add a taste of mint. Also when it comes to my food intake I am again thinking like a size 8. Once I become satisfied eating I simply stop. While we are eating why do we eat past the point of satisfaction. Just save some for the next meal. What size are you thinking like? I am proud of you for taking the steps to get back to the skin you are most comfortable in. I am a strong believer in speaking things in existence, but if you do nothing, then your results will be the same, NOTHING! I too struggle with finding my comfortable skin. I may be small/petite, but it doesn’t make me comfortable. Others tell me “you look fine” or “you just had a baby, it’s ok.” Actually it’s not. I don’t need any more excuses. What I need is time and energy. I realized it order for me to do the things I want to do, including find my comfortable skin, that I must persevere. Thanks for this post. You inspire me. Next Next post: What My Mom Loves Most About Me.